Croatia. When Yugoslavia imploded, the City of Vukovar was under frequent attack. In 1991, the hospital was bombed so that the basement was all that was left. That basement, without beds and without most everything else, served as the “hospital” during the war. They say the Serbian army transported all medical personnel and 267 patients after the bombing but instead of taking them to shelter, took them to a mass grave and put them in it! 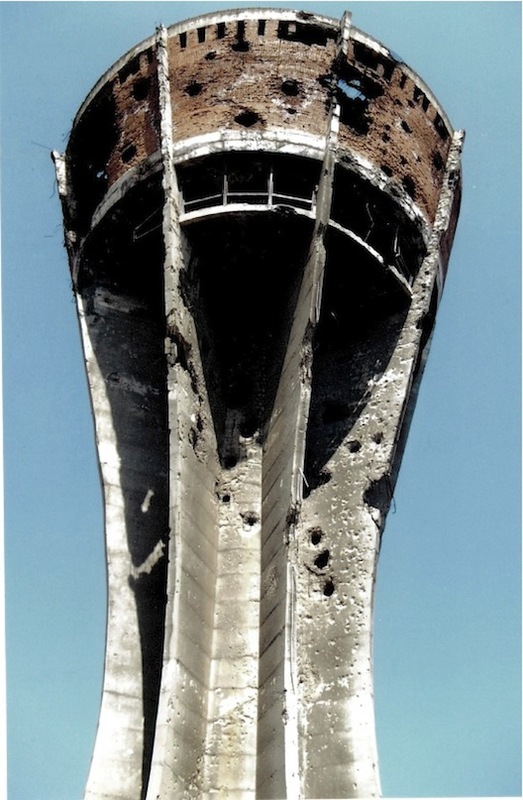 The water tower in Vukovar was heavily shelled during the war. They say it was pierced by 600 shells. (The surface shows many dents and many holes. Did they count them all?) Though severely battered, the water tower stubbornly stands. Like many of the city residents, the tower is silent about the violence. People are definitely still trying to come to grips with that recent chaos. Nobody survives war unscathed. Many there say the U.S.A. masterminded Yugoslavia’s implosion, fearing it could become a third neutral leader after Glasnost and the fall of the Berlin Wall. I strongly disagree. But that is another story.